I found an old page from my own Art Journal and did a new version of it. Then I made a third version of it. Now I challenge you to try this too, and share your process with all of us! 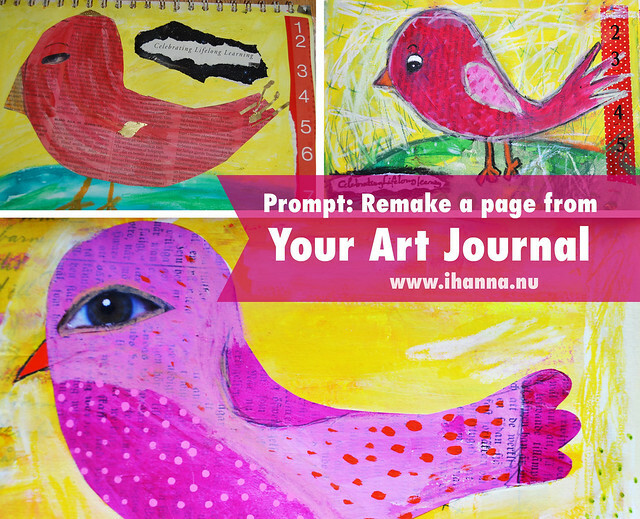 Did you ever remake an art journal page of yours? If not, I challenge you to try it out this week! If you want to try this out, you will have to start by going through one of your older art journals. Try to find a page that you don’t like (or that you actually like but want to try to remake in another version). Keep the book open on your desk and make “a copy” in your current journal, with any changes you feel the page needs! Do the same image with new colors, new materials or maybe your newfound artistic style? What comes out? How did it feel? Be as loose or a strict as you want to, but try to enjoy the process and let the new page/image evolve in the direction it needs to go. So yes, I would like to challenge you to do something like this too. Make a new page taking inspiration from an old one, then show that previous art journal page next to your new one and talk a bit about the similarities or difference you see. Oh, and have fun in the process! You can read the story of how I re-did my page twice in my post on Lifelong Learning, if you want to check it out. And if you want to learn more art journaling from me, get into the 21 Secrets Workshop – it’s ready to be shipped to you as soon as you buy it. HEY GIRL! Arielle, you don’t need to buy it – you won it in my blog giveaway! Yay! And thanks to everyone who entered. 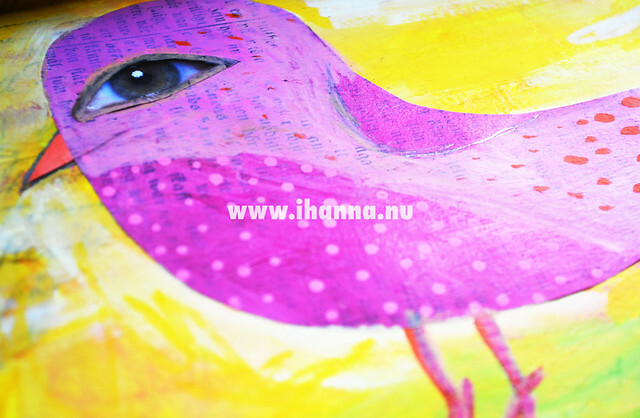 The iHanna Newsletter, with a new chance to win and more creative must-join-things, is coming your way (if you are a subscriber of course, if not JOIN NOW) soon. Any questions for me, post them below! Until next time, stay awesome! This entry was posted in Art journaling and tagged art journal idea, prompt. Bookmark the permalink. What a fun idea, Hanna! Love the different iterations of your cute bird page! And thank you so much for the giveaway!!! I am so incredibly excited!!! I can’t wait to create and learn in the classes and am especially looking forward to your class! Again, thank you so much!! !